A few years ago I met a friend in a Cafe/Bakery I had long held as a pinnacle of urban regeneration and baking prowess. I had just left the University of East London (UEL) re-introducing two old friends that both had extensive experience working in the field of criminal justice. We had spent time discussing workshops for Forensic Psychology students that we would be delivering over the years course. Rise by Solange Knowles is a great intro track for a complex album and it played as my friend and I entered. You may have come across Don’t Touch My Hair that features on the album. The E5 bakery is a teaching cafe and sells amongst other things sourdough bread possibly the best in London. The coffee is very good too! Meeting my friend at the bakery was a culmination of a long held friendship and a cause for Celebration. I had that rare moment of synchronicity meeting serendipity. A choice had been made by my friend that felt important and life affirming. The moment when one realises one’s power. Where flight seems possible. The internal porch light gets flicked to on. The re-awakening of Neo in the Matrix’s final scenes. The culmination of intention meeting luck. A walk and talk client and I had discussed the merits of both Lemonade and A Seat At The Table. As both albums were so dynamically different and yet stretching the listeners appreciation of musical activism in similar ways. We both felt that Cranes in the Sky was worth the whole album of Lemonade. It appeared that Solange had poured her entirety into that one song. Whereas Lemonade felt like the many iterations of a number of heartfelt concepts. My friend had recently decided to change her role and leave the company she was with to join a charity working with service users in Probation. The decision she made was all hers however I felt responsible and to be a person of influence, perhaps I stepped from the role of friend to coach-mentor-consultant. The question is when to offer insights about choice and when not to. The point here is to note that knowledge can be influential. Think algorithms and shopping/buying on the internet. Google and Facebook only know of what you have looked at and as a result know some of your interests not who you are. Do not fall foul of their attempts to have you buy just because you once saw it. By answering a number of my friends questions I was providing personal insight to a number of their considerations. I attempted to be objective. I am not sure I achieved true objectivity, some subjectivity seeped in. Passion runs through me on subjects I have experience with. For people that I know and love – get an uncensored cut. Junie is a sweet throwback song that immediately brings to mind upbeat sunny hot summers, hanging out and younger fresher days. It speaks of freedom and roller skates and ice cream and hot sun, and full trees, riding bikes, barbecues, car stereo’s blasting and block/house parties. Listening to Junie in the E5 Bakery talking to my friend about the choice she was making felt like a welcome return to a warm home after a cold night’s long walk. With summer at it’s height and the evening’s beginning to draw in, I noted my willingness to bake shoot into overdrive. I was asked by a colleague what got me into baking and said “Baking helps me manage anxiety”. Baking helps to stall the thoughts that build about the improbable future by occupying time and ones hands and ones mind with the act of making something – edible gold. In an earlier blog I mentioned that I baked my first savoury bread as a result of not knowing how to begin writing my dissertation for my masters in counselling. In a way baking helped to calm my nerves about the mammoth task ahead of me. Writing a significant piece about my early life and relationship with my mother was an unwelcome challenge. 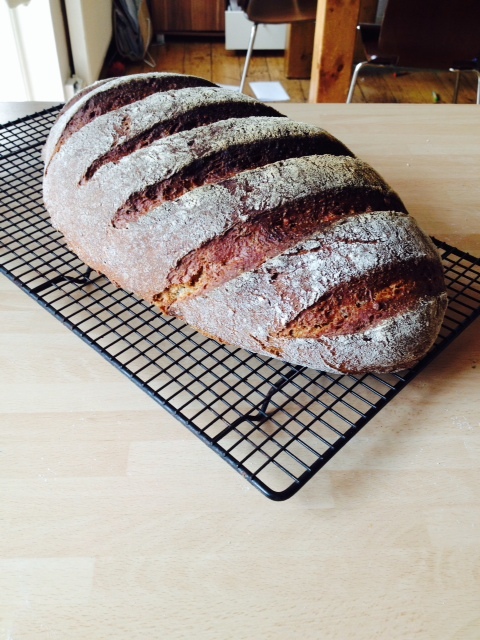 Baking bread helped to transform anxiety and stress into doing something productive and creative. My first ever bread was a banana bread which lead on to an attempt at making an Irish Soda bread. The step from the banana bread to the Irish Soda was not too great. Unlike studying at an undergrad level with Interior Design and then studying at a masters level with Therapeutic Counselling. The transition from Banana Bread to Irish Soda was straightforward. With the Irish Soda, I didn’t need to invest in any equipment like a bread mixer or training, practice and time were the only requirements. Bread baking has taken me to attempt sour dough’s, brioche’s, fruit loaves and pastries including croissants and pain aux chocolate. This is not an advert for suggesting a try at the Great British Bake off. Baking relieves me of pent up energy and emotion and relaxes me immensely. GBBO is entirely enjoyable to watch, to be a participant? Not for me. I could see the vision of the master bake ending up in a bin much like a previous contestant were things to go wrong. Baking remains a joy, a simple pleasure. The product of which can cause a rush of excitement and some envy. 2009 – 2012 Drs Surgery near Camberwell cakes. 2010 -2014 Belmarsh Prison I pushed myself a little and attempted cakes and more complex breads including a quick rye bread. 2014 The University of Kent where I was a student mentor – Breads and cakes. This is where I honed the skill of making the sourdough. A book bought for Christmas that year the handmade loaf by Dan Lepard inspired me. In the 3 years I have worked alongside probation I have brought many breads and baked goods in to offices at Greenwich, Bexley, Bromley, Croydon, Merton, Sutton and Southwark. The bread is usually accompanied by cheeses, grapes, butter and jam or a soft spread. My belief is, those that work in the public domain genuinely are unsung heroes and are in need of congratulating and validation by those they serve and look after (Society). My offerings were a small testament to an idea: ‘Gift others with something pleasant that would be hard for them to return’. The breads cakes and other items I brought in, usually vanished in a short space of time and put a smile on most people’s faces. For me giving and causing for a short while joy, was priceless. Mentioning the GBBO above, stirs my thinking about what Channel 4 will offer us this season? Last year’s departure from BBC1 to Channel 4 did not deter my admiration for the participants or enjoyment of watching the show. It still ticks most of the boxes for good entertainment. A sour faced judge, a fair judge, and 2 comedians bringing levity when things inevitably go wrong. The mini edutainment sections are also in CH4’s edition too. Netflix has all 7 seasons and all episodes. Let the entertainment begin! Sundried Tomato, Onion and Cheese Loaf alongside a Caraway and Raisin Bread. I baked for my team of Forensic Mental Health Practitioners recently – 3 Dan Lepard Recipes: a classic banana bread, a yoghurt and chive bread, an onion and cheese baguette that has an MO addition of sundried tomatoes. Renamed as ‘Pizza Bread’ by a colleague at Together. My anxiety about my moving on from Together enabled me to craft 2 wonderful loaves and a cake as a goodbye to a brilliant team. As a group the NPS team have worked diligently and passionately in probation offices across London. Overcoming a number of unforeseen challenges, obstacles and developments within the service. The bread was to say thank you and that their efforts have been greatly appreciated by me, Together, Probation and the service users they have supported. October 2015 has been an interesting month for me, working as a Forensic Mental Health Practitioner, working as a Counsellor in private practice, beginning a visiting lecturer position at a London University and attempting to write regular bog as well as baking a number of artisan breads, I was asked by a colleague ‘How long have you been baking?’ I said four years and when I thought about it a little more, I realised that I have been baking for a little over 8 years. Cakes were my initial interest and Dan Lepard’s Banana Bread was a firm favourite. It’s a foolproof recipe and delivers an aromatic hum of delight every time I bake it. Whilst on my final year of my MSc Therapeutic Counselling course I struggled with writing up my research ‘A Son’s Journey’. A thought came to me about trying my hand at baking bread. I knew nothing about bread baking and sought an easy recipe. I came across an Irish Soda Bread recipe and after about 3 attempts could turn out loaves of this simple bread every time as well as I could have desired. My bread baking experience grew and I was able to follow Dan Lepard’s recipes with success every time. The current favourite in my household is a Cheese and Onion baguettes recipe that I have altered to a sundried tomato cheese and onion loaf. Baking bread has become a way to relieve stress and process client material into something edible. I see baking bread like alchemy only my product is edible gold. 2 Years ago I developed and ran a baking workshop with a group of African Caribbean men for Family Health Isis in Lewisham. One of the attendees at the workshop asked ‘So where is the therapy in doing this?’ I replied ‘It’s in what is happening right here and right now, the smile on your face and the faces of everyone here, the fact that you are all going to learn how to bake a simple bread and be able to take it home and share with friends and family. The therapy is in the doing.’ With this in mind I turn my attention to the Great British Bake Off of 2014. The season of 2015 ended and I am pleased that Nadiya won. She simply outshone her competition and as the most accomplished baker – won. I felt the spark and nuance of the show is starting to become a little worn. This years contestants of 2016, were experienced bakers who all came with their ‘A’ games ready to shine. Compared to 2014’s tumultuous affair with Ian and Baked Alaskan-Gate I anticipated similar frenetic episodes in 2016. In light of Ian’s departure from The Great British Bake Off 2014 on Wednesday 27th August, I am considering what it was about his implosion that grabbed my interest. As a Psychotherapist/counsellor there was a particular quality to the event that I would like to pick up on – which is that of Transactional Analysis, and use this as a basis to understand what may have had me recognise and make note of Ian’s actions. Was it the fact that another contestant had sabotaged his efforts at completing his signature bake by removing the baked alaskan from the freezer and not informing him of this? Albeit for 40 seconds ruining the chances of it setting once and for all! Was it to do with the fact that after all his efforts the finished article did not stack up to previous bakes he had been successful with? Blowing out of the Bake Off tent to cool off was his only strategy, or it was the strategy he took. Before he left the tent he took his prize bake and chose to put it in the bin! On reflection my interpretation of Ian’s actions are this. Given the idea that he could not meet the judges expectations (parent) he chose to hide (child) his efforts by throwing the cake in the bin. A better scenario would have been to put the cake in the freezer and walk out. Then calm down and present the cake. Then talk to the other contestant about the events of baked Alaskan-gate and how to share freezer space. Then witness another baker like Norman leave the competition and then regroup for the following week. I feel that Ian had nowhere else to go with his feelings but to vent. The camera’s eye was on him and so he took matters into his own safe/unsafe hands by upstaging the proposed Saboteur by throwing the cake away. I felt the perpetrator of the initial attack of the cake’s demise did look a little guilty. As he walked up to the judges with the bin Ian appeared red faced and sorry (child). Mary and Paul (parents) gave ‘supportive’ comments but Ian had sealed his fate (adult) facing the consequences of earlier (child) reactions to a set of unfortunate circumstances. What also struck me about the event is how quickly things descended into a state of chaos. This was not helped by meltingly hot conditions of the Bake Off tent. What surprised me was the inaction of other contestants to what they could see of Ian’s shallow swan dive. I would have liked to have seen a few people speak up about what had happened to the Judges re: Freezer – other contestant- Baked Alaskan-melting or asked Ian to take a walk and talk with them and calm down before the cake entered the bin. Unlike the Bake Off of 2013 events appear to be (imagined mostly on my part) more pressured in the tent and with less humour. The show has always been about baking and presenting the good and otherwise outcomes of using an oven to cook with, but with the additional side offerings of humour, innuendo and double entendres. (Perhaps this has all been side-lined to the extra Slice on Friday’s with Jo Brand). What this show in August 2014 presented me with was how an individual can become unstuck when baking a difficult cake. My work with Family Health Isis and supporting a group of African Caribbean men baking bread highlighted for me that baking can be a hugely therapeutic and rewarding and affirming experience. Baked Alaskan-Gate emphasises for me the need to remain flexible in light of success or failure.